I was going to write a post about how we were all sick and I can't kick this cough and how the kids didn't even make it through one week of daycare without getting sick. But I'm going to write about something else. And if you aren't in the mood for a "I love my kids" post it is now time to turn away from this blog. Still with me? Ok. Consider yourself warned. I spend/spent a lot of time focusing on how I WASN'T lucky. How it was HARD to get pregnant. How bitter I was (am) that I had to travel this hard road to get pregnant. And that my family is probably complete because I can't afford to have another child. But... BUT. And here's the thing. If I wasn't infertile, I wouldn't have twins. Twins. I have twins. Never in my life did I think I would have twins. Never even crossed my mind. I mean, I always thought it was a hereditary thing, and since I don't have them in my family, and neither does Eric, how would we have twins? I have since come to find out that identical twins do NOT run in families, but that is neither here nor there. Now, there is something wonderful to be said for having one baby at a time (I assume). Mostly because you get one on one bonding time with that single child. You get to ease your way into parenthood. You get to really focus on giving that baby everything they need. With twins it's so different. You can never focus on one baby for entirely too long. You never get a free moment. If one doesn't need you, the other does. If your husband is home, you can't hand the baby off and go do something, because there is another baby waiting to be fed/changed/etc. But I've learned something in the past month. My twins are friends. They are each others first and best friend. They smile at each other. They play with each other. They chase each other around. They giggle at night when we put them to bed and they are supposed to be sleeping. They crawl to the end of each other's cribs and giggle through the slats at each other and make little high pitched shrieks and yells. Their daycare teacher, Miss Andrea, said they are the first babies she has had in the infant room that really play with each other. Hailey always doesn't nap as long as Jake, and when she wakes up and comes back to the playroom, she crawls around and tries to find him and looks sad until he wakes up. Then she is all smiles and chases him around. I am experiencing something right now that I am going to consider a gift from my infertiliy. I'm raising twins. A brother and a sister that are going to be best friends. Two completely different children that shared my womb and will always have a special bond. They will always see each other across the room in daycare, and know that they aren't alone. They will always have that familiar face by their side, and take comfort in it. It's just truly, the coolest thing ever. I think it's so easy to focus on the bad side of infertily, but for me, there is a huge upside. My twins. There are days where it is hard. As they get older, and are more mobile, and get into everything, it's more work. I feel like I can't just get one babysitter, I need two. We NEED man to man coverage. So sometimes that's tough. And that daycare check, OH, that's a tough one to write. It's a heavy hit. And sometimes I'm just SO tired. I would love a break. But the pleasure, the joy they bring, it's really immeasurable. How can you measure kisses and hugs? How can you explain how it feels to pick them up from daycare? To walk into the center, sit on the floor, call their names, and have their little faces light up, as they crawl over lightning speed to dive into my lap? You can't measure it. Sometimes I even get caught off guard tell people that I have twins. It still sounds super odd just coming out of my mouth. How the heck did it happen?? Oh yeah. I'm infertile. And maybe, just maybe, it ended up being the greatest blessing of my life. Oh well, you've been good for reading this far. Here are some pics! That post gave me chills. . .it was beautifully written, and so true!!! Thank you for pointing out the bright side in all of this! I love this post! I'm so glad you're able to see and enjoy the upside of this hell we've all been through. Plus you made me even more excited about my twins! I love the friends aspect. It will be so cool to see them grow up as best friends. PS - Sorry everyone's sick. This is such a wonderful post. I guess sometimes we forget how at the end we are very lucky. ok, did you have to go and make me tear up at work? I often think about that- that if I werent if, I wouldnt have these two little girls at the same time. Sisters. I never had a sister and so longed for one. They will be each other's best friend (I surely hope). I cannot wait until they start interacting with one another. That was wonderful. You and Eric are truly blessed. Those babies are just so darn adorable and cute. Auntie Ar misses them. Hugs and kisses and see you soon. Your post really touched me, it really hit home. Although, I do not suffer from infertiity, I suffer from no man in my life due to my pickiness. I thought my dream of having a baby would never come true as my biological clock is ticking. I know you must think how unreal it all seems, you have beautiful boy/girl twins! Your infertility brought you the greatest gift of all. :o) You are big time blessed! You know...I sometimes get choked up when I walk into Kindercare and I can hear the teachers saying that Hannah's MOM is here, or when people refer to Hannah as MY DAUGHTER! Am I living a fantasy? From time to time, I look at Hannah and think to myself, "THIS BEAUTIFUL GIRL IS MY DAUGHTER," and tears of happiness fall from my face. They already are the best of friends. We are so blessed beyond measure! I so hope my children are as close as yours are. It will make my world. Thank you for saying exactly what I feel. My struggle with infertilty was painful, scary, and just plain hard. However, my twins are the greatest blessing and joy. I wonder, at least once a day, how I got so lucky to be infertile! Beautiful post! 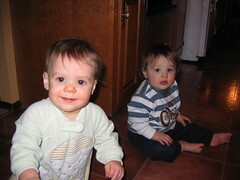 Please check out our blog when you have time (hahah....like any mom of twins has TIME!). Erica, I have written a post about this, too, and I want you to read it before I post it. Would you email me so I can send it to you? Erica...I heard today is your birthday-Happy Birthday!!! !